One of the favorite treats and desserts around the world is ice cream. Almost every country in the world has its own signature ice cream, usually based on the resources close to their nature, the weather, and culture. Despite the infamous coldness, Russia actually also has its special kind of ice cream called plombir. It is said to be the most nostalgic ice cream in the country because of the long history way back from the Soviet era. A lot of Russians reach out to plombir to find the fond memory of their childhood. So, what makes this frozen dessert so special? We are about to find out why by unfolding 7 surprising facts about Russian plombir ice cream. In the 19th century, a confectioner in a town named Plombier-les-Bains in France. The confectioner was well known for their innovative recipe of a cold dessert which consisted of assorted fruits that had been soaked in cherry vodka then mixed with eggs and frozen cream. This recipe was then brought to Russia where the original recipe has been tweaked over time but the name still honors the place where it comes from; plombir. When plombir crossed over to Russia in the 19th century, still Soviet at that time, the production of the dessert must follow the rules of GOST which is the national standard of everything made within the Soviet’s domain including food and beverage. This government controlled standard required plombir to be strictly and specifically made only with natural ingredients. This was what caused the original recipe needed to change in order to meet the GOST requirements. The Soviet Union food standard at that time emphasized nutrients more than flavors. For plombir, it must be high in fat (from 12% to 20%), sweet (14% sugar), and quite solid (37% to 42%). This standard is still carried on until today to differ plombir from any other ice creams in the world. The fat is derived from milk and cream. The higher the content of the cream, the higher the fat. In the Russian market you can choose between classic plombir and fat plombir to suit your need and taste. For the sweetness of this frozen dessert, Russia uses condensed milk in addition to sugar. This adds to the fat content and makes plombir not suitable for several kinds of diet. Because plombir needs to contain more solid rather than liquid, it is consistently dense but soft even when it is fresh out of the freezer. The mixture of heavy cream and egg leaves almost no room for liquid which means there is no ice to form in plombir and that is why it is always soft. This what makes this legendary Russian dessert very desirable; a real comfort to the tongue. Plombir is actually the basic ice cream that can fill any containers or accompany other desserts, cold or hot. It can be put in a cup and become stakanchik, fill a cone to be a sakharniy rojok, put on a stick as an eskimo, cut squarely as a slab of briket, or covered with frozen chocolate shell as a lakomka. A scoop of plombir can also be put next to or on top of hot or warm snack and dessert like pancake or waffle. Also, because the root recipe only calls for cream, egg and milk, plombir can be tweaked into many flavors and mixture. The most common flavors of this ice cream are vanilla, chocolate and strawberry with vanilla as the most favorable one. The original recipe from France calls for vodka and chopped fruits, but in Russia these two ingredients aren’t always included in plombir especially in the ones sold in convenient store or to children. In restaurants, though, plombir is sometimes served in a fancier way with toppings like fresh fruits, biscuit, chopped nuts, or glazed with honey or caramel. In short, plombir can be anything you want it to be. 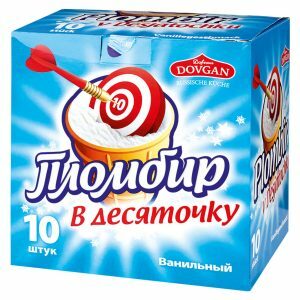 Long time ago, when plombir first came into the Soviet, the production was only limited in Moscow and Leningrad due to the limitation of confectionery and available sources of cream and milk. Today, though, plombir can be found in almost all countries that used to be governed under the Soviet Union and also in Germany. However, the plombir you can find outside Russia is the generic type that comes in a package and is shipped from Russia. If you want the authentic and specially tailored plombir that is served with toppings and everything else on the side, you should come and visit Russia. Not only during the summer, because this dessert is available for the entire year. Looking at the history and the long list of how plombir can be served, you might think that it is too difficult to be made at home. But, guess what, it is not! The quite common ingredients of the basic plombir allow everyone, around the world, to try and make their own kind of it. You only need sweet condensed milk, cream, milk, sugar, eggs and an ice cream maker that works. That is all and you are good to go and make your own plombir. Both basic and tweaked recipes can easily be found all over the internet. If you ever have a chance to visit Russia, this is a dessert you should not miss. But if going to Moscow is still a far-fetched dream, then you can always try to make the ice cream yourself. The 7 surprising facts about Russian plombir ice cream above hopefully have given you an insight about how Russia wants and loves its dessert to be made and served. So, how would you like to have your plombir?